Way back in the mists of time, my friends and I stumbled across The End, a now-defunct club that put on an absolute banger of a night. Mr. C played there regularly, along with part-owner Layo & Bushwacka!. Unfortunately that night happened to be on a Sunday - but, no matter, we're young! We can go to work on 3 hours sleep! I actually slept at work a couple of times to avoid wasting time on the journey home and back, quietly emanating boozy fumes. Those were hazy days and I've long since avoided the Sunday night rave, but when I heard of The Palomar, a new restaurant part-owned by none other than the Layo of the pair, the memories came flooding back. The Palomar, imported from Jerusalem and headed up by an executive chef who has his name to five restaurants there already, serves food from modern-day Israel. At least, that's what they say; I don't have any experience of Israeli food, so much of it is a mystery to me. On the Wednesday night we visited, the bar lined with stools was packed. Chefs worked away busily but smiling, music played and there was no sense of a reverent hush. Front of house took our number to call us back when there were seats available; a far more civilised attitude to a world without reservations, and once we'd clambered up onto our seats at the bar, the fun began. The reservable back dining room, which seats around 35, seemed like the grown-ups corner. Because that's what The Palomar is. It's really fun. The chefs behind the counter talk to you, tease you, guide you towards their favourite dishes. There's banter, there's a little flirting. Every so often a shot of lemon-flavoured liquor appears, ice cold, with one for the originator. Cocktails are plentiful. Mini polenta, 'Jerusalem style', arrived in a Kilner jar. The mushroom-dotted polenta was liquid and creamy, irresistibly perfumed with truffle oil and we scrabbled at the jar in earnest. Moroccan oysters came splashed with a spicy oil, quelling some of the natural brininess of the oyster, though perking it up with lemon zest. A spring salad, crunchy, vibrant and tart offsets a dish of richly braised, soft octopus with chickpeas which was incredibly comforting. We looked with lustful eyes at our neighbour's raw salmon and green apple salad; a minute or two later, a taster portion was set down before us with a wink. This was further up my street; silky fish, the intensity of the salmon flavour mellowed with sweetness and tartness of the apple, a spike of chilli from the round of jalapeno perched on top. Not being a massive fan of bread (yes, I know...) it's not usually something I'd order as an extra in restaurants. The chefs had other ideas and served it to us anyway, and I'm incredibly glad they did as it was one of the best dishes. A domed brioche ('Yemini pot bread') was tapped out of its receptacle from the oven onto a plate, served with a tahini dip and a tomato dip that tasted like the very essence of tomatoes, mellowed with a little cream. It was so good my friend finished off the pot and made them squirt us more. The next day we fantasised about a full glass of the stuff, spiked with vodka, to rid us of our headaches. Our main, mussels in a spiced tomato stew, was jazzed up with a langoustine languishing on top. Warm, hearty and filling, it was the perfect size to share in the follow up to the small plates we'd devoured. Other dishes like pork belly tagine, neither kosher nor halal, shows perhaps a leaning towards pleasing the London market. Desserts aren't for the faint of heart or the small of stomach. Malabi was a rose-scented milk pudding. The flavour of rose was mercifully light, dotted through with crisp and chewy coconut meringue. Kataifi is the little nests of pastry filaments, baked (or fried?) until crunchy. A puck of chocolate mousse was dense and rich and it defeated me. A gift from the kitchen came in the form of tahini ice cream and caramelised figs; while I loved the fruit, the tahini was too intense, too claggy for my liking. It stuck to the roof of my mouth like peanut butter. I didn't love everything I ate at The Palomar (I'm looking at you, Mr Tahani Blob) but nevertheless, I came away thinking that was one of the best restaurant experiences I've had recently. It was everything you could want in hospitality; a warm welcome, a fun crowd, just the right level of interaction to be amusing but unobtrusive. They've got it bang on. I can't wait to go back. Well aren't we a lucky bunch of South Easters? 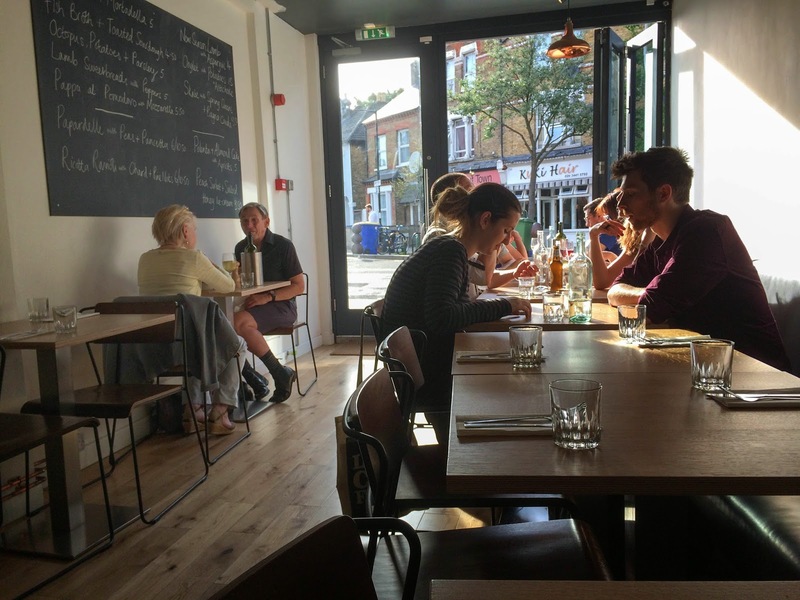 Artusi is Peckham's latest opening; it was raved about by Jay Rayner as well as Time Out, which might so some way into explaining why their phone line was constantly engaged on the day I tried to book a table. My perseverance paid off though. The room is small but well lit, encouraged by floor-to-ceiling glass windows. On a Summer's evening, the sunshine streamed through, bathing everyone and everything in a soft golden glow. We relaxed into our Friday evening negronis, crusty bread slathered with butter to help us make our menu choices. The menu is short, scribbled on a blackboard - five starters, two pastas, three mains. Terse descriptions are made of each dish - 'Onglet with potatoes and artichokes', for example - no fripperies or romance of language, which to me conveys Italian cooking so well. The art of sourcing good, flavoursome ingredients and cooking them with sympathy and care is what my experience of this cuisine is all about. Turns out we didn't have many hard decisions to make; the three of us were hungry enough to order basically the lot, save a couple of starters. 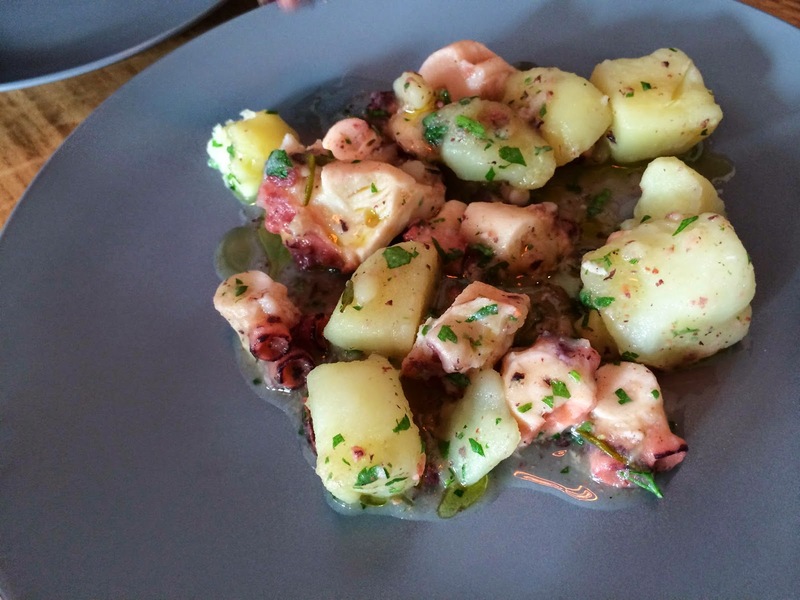 Of these, the potato and octopus salad was shot through with herbal freshness, the olive oil grassy and aromatic. Tender octopus met soft, creamy potato. Lamb sweetbreads held much more excitement for me. 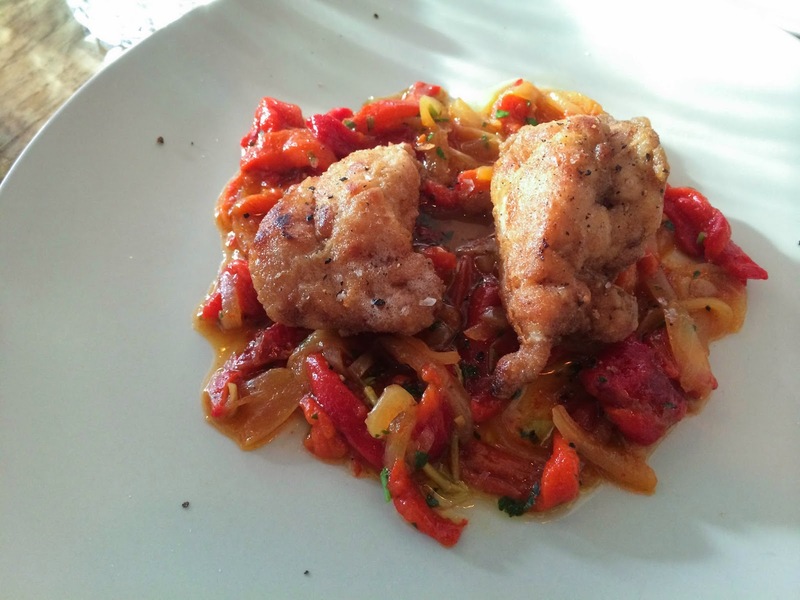 It was accompanied by a sweet and sour peperonata; a tangle of red and yellow softly stewed peppers complementing the cloud-like fluffiness of the crisply fried sweetbreads. For £5, it was incredible value - a hearty portion, but the flavours were also well accomplished. 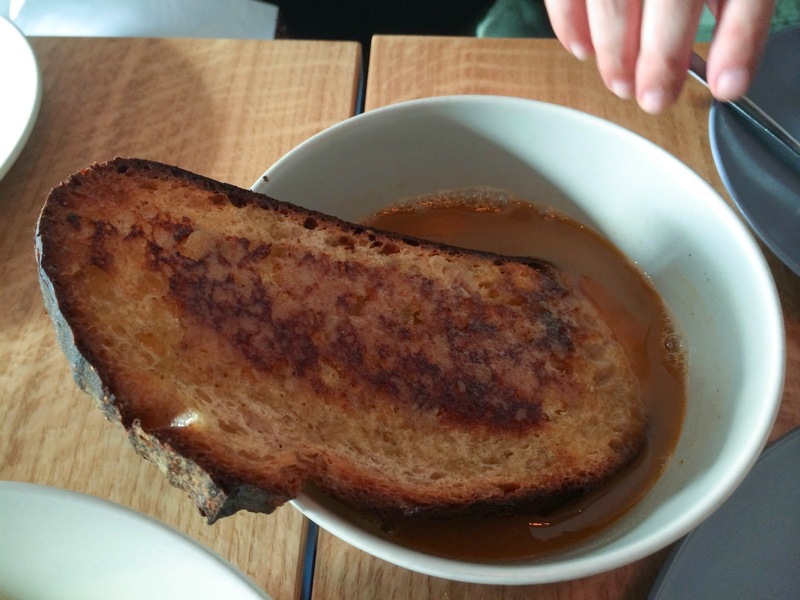 I wasn't enormously keen on 'fish broth with toasted sourdough', but then it wasn't something I would normally choose - my friend fancied it. I prefer my fish soups with a bit more substance and texture, though this is not really a complaint, given the menu description. The toasted sourdough was rubbed with a not-inconsiderable amount of garlic, which pleased me. Pastas were completely incredible. 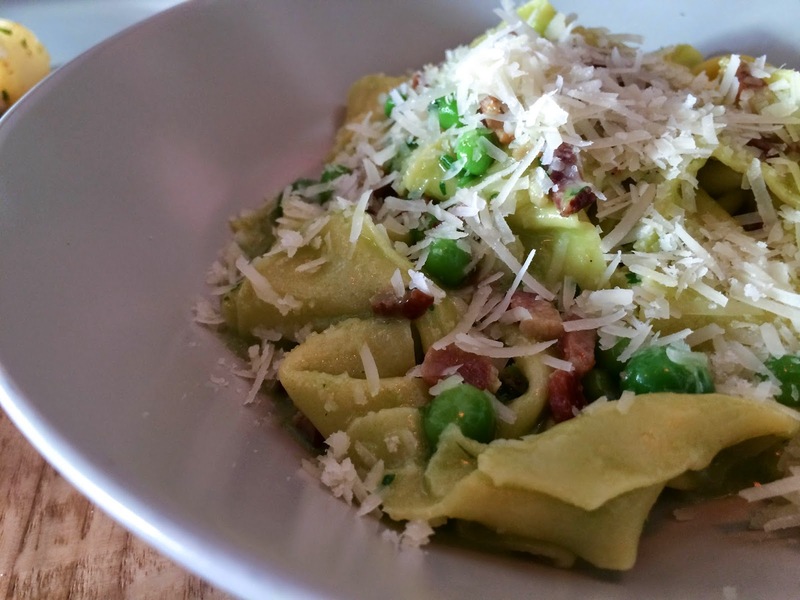 Home-made pappardelle with pancetta and peas came topped with a pile of grated Parmesan, which melted into the soft folds of the noodles. 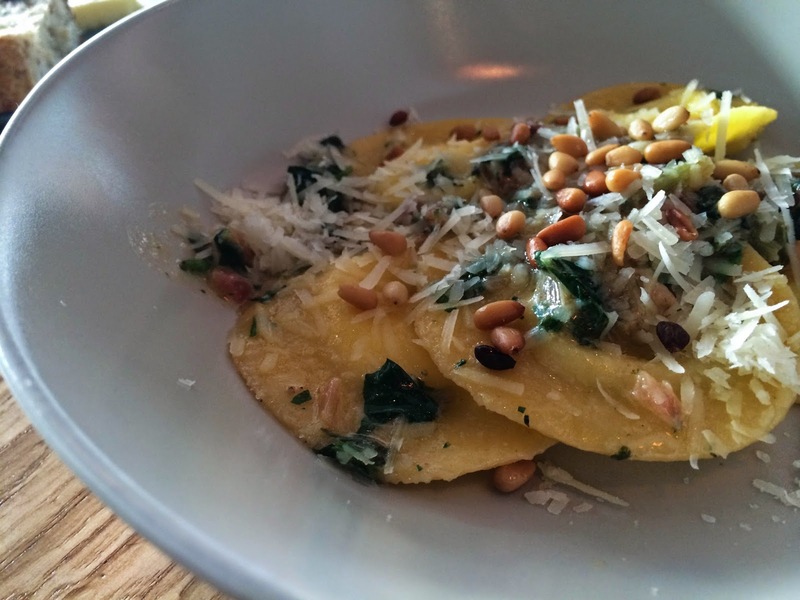 Ricotta ravioli with chard and pine nuts were made of thin, delicate pasta, the creaminess of the ricotta saucing each mouthful. By this point, we knew we were onto a good one. 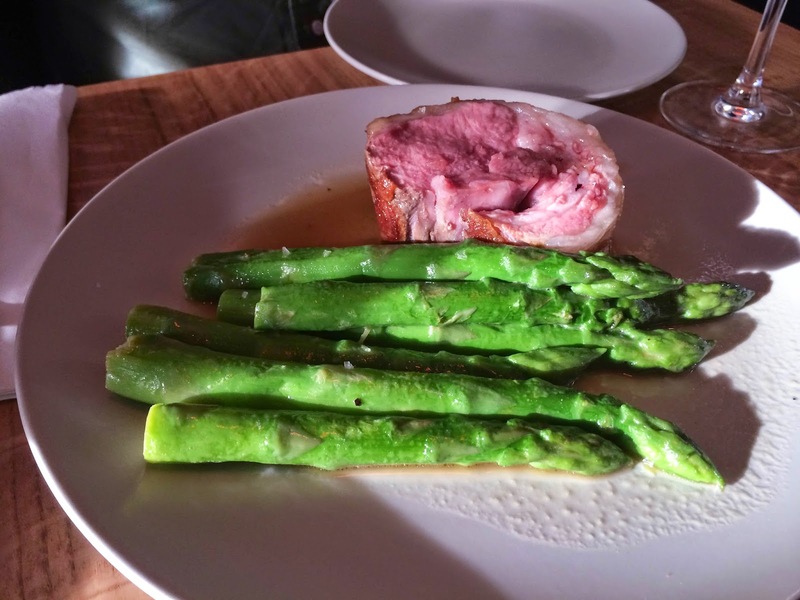 New season lamb with asparagus was exactly that. A perfectly cooked, thick slice of lamb was dressed in a light sauce. I felt like some sort of carbohydrate would have made this dish more complete, though our bread basket was happily replenished. 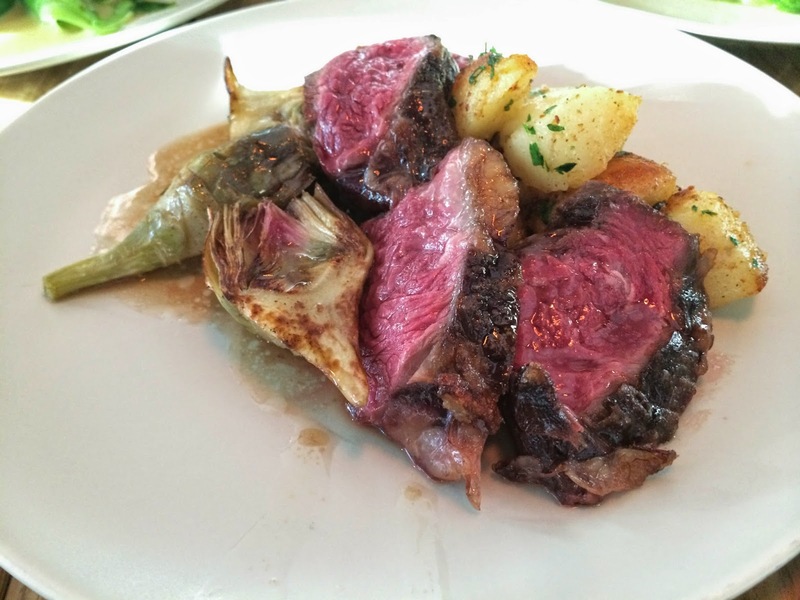 No such issues with the onglet, potatoes and artichokes. The potatoes had been fried until they were crisp on one side, for that all important textural contrast. The artichokes too had been given the same treatment; coupled with the seared ruby-red onglet, this was one of my favourite dishes of the night. Simple but incredibly pleasing. 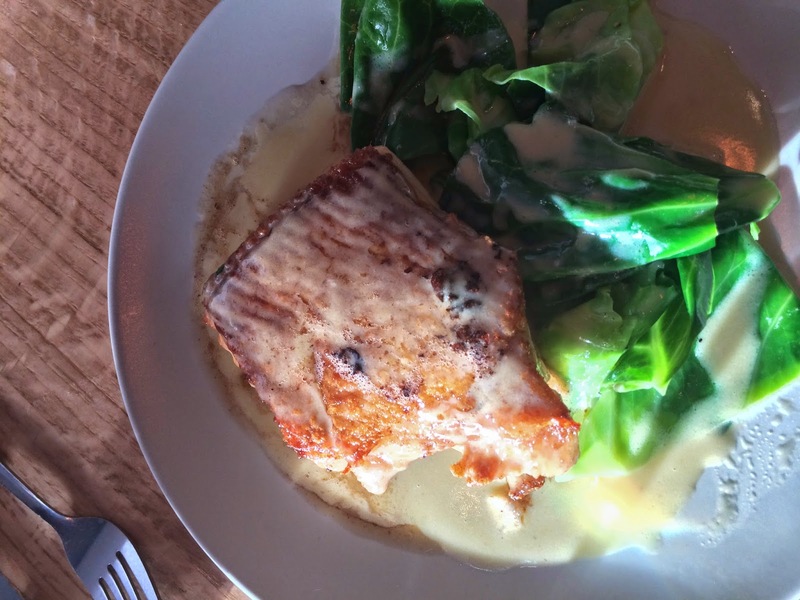 I'm not entirely sure where I was going with the angle of this picture, but by the time we tucked into the skate wing with bagna cauda we'd had some wine, and apparently I tried to get arty. That went badly. But the skate itself was a thick slab, bronzed and crisp, tender meat pulling away from the cartilage bones. The bagna cauda, a sauce made from garlic and anchovies, was certainly punchy; steamed spring greens were essential in levelling the flavours out. It had a tendency to tow the line between well seasoned and salt overload, rectified by a little less sauce. Having had pretty much three courses by now, we could only share a dessert between the three of us. Peach sorbet with salted honey ice cream was the stuff of refreshing dreams. When we got the bill, we were surprised with the £48 / head we paid - we'd eaten a lot, drank really quite a lot and it seemed wonderfully low. I woke up in a panic the next morning that we'd under paid. I wish restaurants would just put the optional service charge on - my maths often suffers from wine - but having ferreted the receipt out of my handbag, we hadn't embarrassed ourselves on this occasion. It was just really great value. With an often changing menu and the happy compromise of bookings being taken for dinner, some tables reserved for walk-ins, I know I'll be back soon. Bray is a strange little place. About an hour's drive from London, it is currently home to Heston Blumenthal's The Fat Duck and Michel Roux's The Waterside Inn, 3 Michelin star heavy hitters. Heston owns a further two pubs in the village; The Crown and the Michelin starred Hind's Head. Phew. Imagine the amount of money and protruding bellies that go through this village. Who lives there? What if you fancied a supper of chips and curry sauce? I made a last minute booking at The Hind's Head to break up our journey home from a weekend away. The ease in which I was able to get a Sunday lunch booking was surprising, though made less so once we arrived and surveyed the vast number of covers, both downstairs and upstairs. All exposed wooden beams and drab maroon carpets, you would be forgiven for thinking you were at a Carvery off the A12. The giveaway were the staff, dressed smartly and bustling around the tables, and of course, the menu. This is no standard pub grub, no least because the roast sirloin of beef is twenty six of your hard-earned pounds. But before that, the starters. We shared three, and a scotch egg - a little oval puck, freshly fried and greaseless, a light meat encasing a perfectly runny egg. A smear of mustard was all it needed; it was a refreshing change from the more complex, heavily seasoned or spiced offerings you get at a lot of places these days. Soused Cornish mackerel with radish and grapefruit was the first nod towards the Michelin standard; a pretty plate with a near-perfect balance of flavours. The richness of the mackerel, lightly torched on the skin, held the bitterness of the pink grapefruit well. Toasted wafers of bread and thinly sliced radishes added crunch, and a tartare of the soused mackerel was the bed upon which it sat. It was full of the joys of Summer eating. Equally pretty was cured duck ham with asparagus and spring leaves, made delicious by a soft boiled quail's egg perched on truffled mayonnaise. Lightly charred artichokes nestled underneath the leaves, giving the dish some hearty structure. I don't recall there being any crispy bacon as advertised on the menu, but I'm not sure it needed it; the duck ham was sliced so thinly it was translucent, yet flavoursome enough to make its mark. Star of the show though was the 'hash of snails'. Light on description, what it turned out to be was a lot of snails all chopped up and piled on a piece of toasted bread. A green smear of what tasted like a wild garlic sauce buttered the bread, and a tangle of thinly shaved fennel completed the dish. This was so good - the crunchy toast, the squidgy sauce, the slightly chewy snails - especially with the addition of toasted pistachios, nutty and salty, punctuating each mouthful. Being that it was Sunday and we are British what what and such is tradition, we ordered both the roasts on offer. The pork, made with collar rather than the more traditional shoulder, belly or leg, was given a modernisation with a prawn-cracker-like puff of pork crackling. A cylinder of stuffing was herby and dense, the pork flavoursome and juicy. The roast beef was perfectly medium rare, two hefty slices lined with creamy fat. The potatoes were perfection themselves; crisp on the outside and creamy and fluffy within. Sauces were as far from the jar as you can get; horseradish was spicy and astringent, whipped into a smooth and stiff cream, and apple sauce was perfectly smooth, cloudy and almost jellied in texture. My Yorkshire pudding looked suspiciously like our favourite Aunt's, but it was crisp and bronzed, with the structure to hold my gravy. My only criticism, in fact, was that the vegetables were aggressively dressed in a herb butter. Spring greens, fine beans and carrots are a great accompaniment but coupled with the rich beef jus - it was so concentrated and clear, I steer away from calling it a gravy - I craved some simple vegetal relief. My friend's oxtail and kidney pudding proved that the rest of the menu warrants a return; rich suet pastry, steamed and glossy and stuffed full of tender shredded meat. I only had a taste but the glazed look of satisfaction on his face told all. From an extensive list of desserts, we ordered the Quaking pudding and the chocolate wine slush. Little fact sheets were given to us to explain the origins of the desserts, but once the quaking pudding was set before me I only had eyes for the wobble. A pannacotta, basically, set most delicately. It was flecked with vanilla, smooth and creamy, a predominantly egg flavour and served with a slice of caramelised banana. Lovely stuff. The wine slush was less remarkable and I left the rest of the table to it. So, all in all, a brilliant lunch, each component done as well as it could be. Those seeking Heston's weird and wacky molecular gastronomy may well be disappointed here, but flashes of it can be found on the drinks menu; we were treated to a taste of it by this Demerara Old Fashioned. A canister of dry ice billowed out a rum-scented mist so that it hovered within the glass. The liquid itself was dangerous; I couldn't taste a hint of booze, just a sweet maple fragrance. For such an enormous place with various nooks and crannies, one might easily be neglected but the staff were plentiful and pleasant, unobtrusive but helpful. It's not a cheap lunch - the three of us paid £56 per head with a couple of drinks each but the quality of the food and the skill of cooking and preparation was apparent. It could do with a bit of a spruce up inside, though.